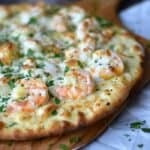 Shrimp Scampi Pizza topped with a light garlic-lemon sauce, shrimp, and cheeses. Place baking stone in oven and preheat to 500 degrees for ONE HOUR! In a large skillet, melt butter and oil over medium-low heat. Add the garlic and lemon zest, cook for one minute. Add the wine and lemon juice, simmer for 2 minutes. Add shrimp and cook only until pink. Remove from pan and set aside. Roll out pizza dough. Place on a cornmeal or parchment paper lined pizza peel. Brush dough with garlic-lemon sauce from pan. Be generous. but you don't want your pizza to look like a lake. Top with shrimp, mozzarella cheese, Parmesan cheese, and sprinkle with Italian seasoning. Slide pizza onto preheated baking stone and bake for 8 to 10 minutes, until cheese is bubbly. Serve with red hot pepper flakes.